Alisha Sellars, Shuswap/Secwepemc from British Columbia, is 21 years old, a mother of a 2-year-old son, works full time, and is a full-time Northwest Indian College (NWIC) student working toward becoming an elementary or early-education teacher. 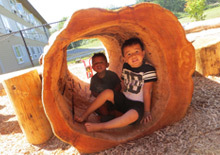 Sellars’ goal to teach in Native communities has been fueled in large part by her work at NWIC’s Early Learning Center (ELC), a daycare and school on the college’s main campus on the Lummi Reservation. Since Sellars started at NWIC, her goal of becoming a teacher has started to become a reality. She started working part time at the college’s Early Learning Center in April 2012 and in January 2013, was hired to work full time at the center. Sellars, who grew up in part in Canada and on the Lummi Reservation, said she has always known she wanted to attend college. Her parents, who are college graduates, always encouraged her to pursue higher education. Still, even with all of her ambition, Sellars’ first stab at college didn’t feel right to her. She attended a non-Tribal college, and said she just felt like a number. During Sellars’ first two quarters at NWIC, she needed to bring her son to class, and she said her instructors were very understanding and accepting of both of them. “I feel like I have made a lot of family at NWIC,” Sellars said. She said one instructor, Alex Prue, even felt like a grandpa to her. Through her work at the ELC, Alisha became involved with the Sacred Little Ones Project, which she said has changed her perspective on early learning. The Sacred Little Ones Project, known also as Wakanyeja “Sacred Little Ones” Early Childhood Development Initiative, is supported by a $5 million grant award by the W.K. 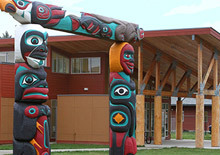 Kellogg Foundation to the American Indian College Fund to establish four early childhood development centers located at tribal colleges and universities and serving Native children. NWIC is one of those locations. 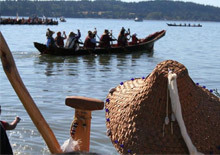 The purpose of the project is to improve young Native students’ skill acquisition; prepare them for grades K-12 and post-secondary education; improve the quality of early childhood teachers in Native communities through partnership opportunities with post-secondary teacher training programs at the tribal colleges; bridge early childhood and K-3 education; integrate Native language and culture into early childhood curriculum; and empower Native families and communities as change agents in education for their children.